A total of 17 tape-based instruments are emulated in SampleTron. IK Multimedia has a habit of announcing products well in advance of their actual releases. The StompIO seemed to be in development for an eternity, and it´s taken over a year for the company to get its SampleTron instrument onto the market. The second of IK´s Sonik Instruments, SampleTron emulates not just various versions of the classic Mellotron, but also a range of other vintage tape-based instruments. It´s built around a 2GB sample library, and offers 640 presets. SampleTron is powered by IK´s SampleTank engine, which gives you access to 32 built-in effects (four of these can be used on each of the 16 parts). There are three synth engines, and the sound can be tweaked with over 50 synth-style controls. The software is Mac- and PC-compatible and runs standalone and as a VST, Audio Units and RTAS plug-in. It costs $330/€250/£229, and crossgrades from other IK products are also available. Find out more at the IK Multimedia SampleTron website. 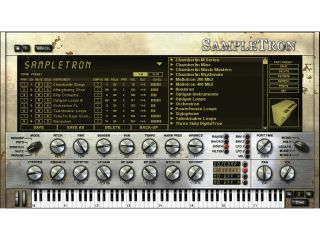 Of course, SampleTron isn´t the only Mellotron-inspired instrument on the market - GMedia´s M-Tron has proved to be very popular over the years, and the company is currently working on the M-Tron Pro. No news on when this will be released as yet, but it´ll be interesting to see how it compares to IK´s offering.